The year of EDM 2012. 2012 started like every other year, with some drunk new years resolutions, at a rooftop terrace, looking out over a snowy Stockholm, the mandatory cheap champagne and all friends cheering and laughing. Although 2012 was just a child then, I don’t think anyone could know how it would turn out. If I look back over the past year I can say it has been a really great year, music-wise at least. This year is the first year Electronic Dance Music has been accepted in Sweden. Not that long ago, people said that everyone who listen to house/trance/etc is a drug addict and should be put away in some prison for disturbing the peace. Back in 2011, a huge party called Majestiq 12 was cancelled due to high costs for the police force that had to be there to make sure no one is taking drugs or fighting. When this happened we were many who thought that this was it, no more festivals, no more arena-sized parties with Electronic music. But, 2012 something happened. The big 2-day outdoor festival Summerburst was broadcasted LIVE on Swedish Public Television, with djs such as Tiësto, David Guetta, Sebastian Ingrosso, Nicky Romero and Calvin Harris. Summerburst had over 65000 visitors during it’s four days (two days in Gothenburg and two days in Stockholm), and that was just the beginning. The Swedish wonderchild Avicii played for three sold out shows in front of 34000 visitors in Stockholm Globe Arena (at that time the biggest concert venue in Sweden), and the Swedish House Mafia had three sold out gigs at the newly built Friends Arena, housing a total of 120000 visitors over the three shows. This is something a EDM-fanatic like me only could dream about a few years ago. But, somehow, if we look at smaller promoters, it seems like the people has abandoned them, unless there is some Hardstyle-dj or similar playing. Then it’s full house. Our scene has changed, and it’s sad to see what it has become, and the Swedish EDM-scene has grown huge this year, and the trend seems to be never ending. More and more people attend the biggest event and leaves the smaller to die. Our beloved Swedish promoter Monday Bar, who has celebrated their 20th birthday this year, have had an great year with a lot of parties. First off was the Springbreak Cruise onboard the 203 meter long Cruise ship Silja Symphony. This vessel is a little special since it has an 140m long shopping street on the inside. This was of course the main floor with Ferry Corsten and Headhunterz as headliners, among other great dj’s. In 2012, we launched our new design layout, making us the only Scandinavian EDM-webzine based in Sweden. We launched with some new functions, among others the Classic for the Weekend, which has become a really popular part of the page. Our writer Niklas has not yet run out of classic-tunes to write about, and I don’t thinK he will either. Another great thing with the re-launch of bejbi as a webzine, is that we now can write about parties, music, lables and basically everything. This will be more noticeable in 2013! This year was also the start of an new era of bejbi.se’s podcast. We merged us with the talented dj Tatsumi Suzuki’s podcast #podgressive, and it has been a success. We now have over 4000 listeners every month, and it rises every day! Our plans for 2012 was to have at least one party together, and in June 9th it was time. We had a SummerJam-party at the nightclub Slakthuset in Stockholm and the party was nothing else but a success! We also did a really fun collaboration together with Future Sound of Sweden and Kidson Mediaproduction in Zandvoort, just outside Amsterdam later in June. We held an Swedish midsummer night, with an all star swedish lineup. It was an unofficial warm up to the Luminosity Beach festival. I for one can say that that was just the beginning! Music wise this year has been really strange. The mainstream radio stations in sweden has begun to play some sort of EDM. Which has lead to a lot of great music coming out to the wider masses here. Unfortunately it’s mostly Swedish House Mafia and Avicii, but sometimes a real piece of gold sips out, like Porter Robinson – Language. There has been a lot of great releases this year, and it has been a tough task to come up with three top tracks but I’ll give it a try. A beautiful vocal trance track that unfortunately didn’t get as much time in the spotlight it deserves. What can I say, this is the Trousetrack of 2012, love it in every way, every part of it! Tune of the year! Heard it the first time at Luminosity Beach Festival in June and loved it right away! Let’s see what 2013 has to offer. 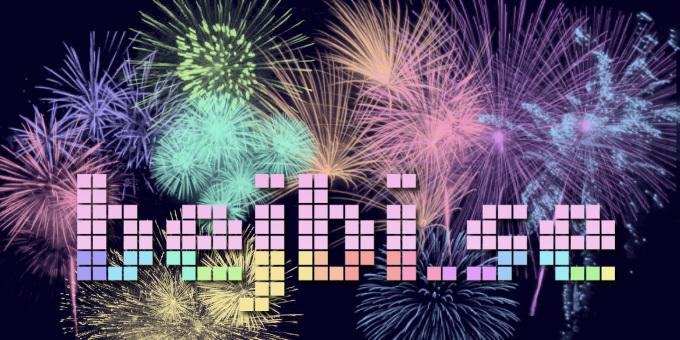 We here at bejbi.se wishes everyone A happy New Year! 2 Responses to " Article: The year of 2012 "
Can’t find so many words to add there.. Well written article! I’m up for 2013 booyaka! Happy new year bejbi!